Mocandunda is an aboriginal word from the Ngadjuri people meaning rocky outcrop on top of a hill. It’s on one such rocky hill that three men with Clare Valley dirt in their veins have established a vineyard that brings all their experience and local knowledge into singular, crystal clear vision. 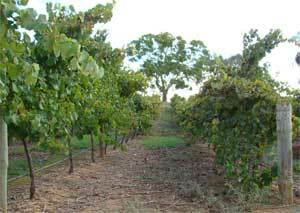 It was established in 1998 by Hartley Heinrich, the property’s owner, Rodger Ackland, one of Clare’s most experienced viticulturalists and founder of Mt Horrocks Wines and Mick Faulkner, a leading South Australian agronomist. Rodger had long recognised the potential of the site and had been share farming the land with Hartley, with help from Mick, when all three men decide it was time to take this special place to the next level. And so Mocandunda Vineyards was born, a project with impeccable local pedigree and enormous potential.